It’s all about the body oil. RAMBO III continues the RAMBO legacy by effectively blowing things up with wild abandon, while Sylvester Stallone keeps his shirt off. And why shouldn’t he? He’s arguably in the best shape of his life for this third outing as John Rambo, the unstoppable ex-Special Forces killing machine who has never met a battle he didn’t French kiss like a drunken lover. Explosions ensue. And body oil. Movie opens as Trautman and a government spook (Kurtwood Smith) track down Rambo stick-fighting in Thailand, all sinewed muscles and intense staring; he’s also leading the ascetic lifestyle at a monastery, introspective, humble, and trying not to look too much like Paul Stanley. Still don’t know why Rambo is always happy to see Trautman, when he knows the guy never makes any social calls – every time he tracks down Rambo, it’s for another mission. Trautman entreats Rambo to accompany him to Afghanistan to supply weapons to the Afghans. Which Rambo dutifully declines for the sake of his character arc, his mantra as always, “My war is over.” So Trautman plays Big Man and says he’ll go in alone, leading a bunch of expendable extras. …precipitating Rambo’s involvement. “This time it’s personal” and all that… At one point, someone asks Rambo why he is going through all the trouble to rescue Trautman. Rambo retorts, “Cos he’d do it for me.” Uh, don’t mean to burst your bubble Johnny, but remember what Trautman did for you in RAMBO: FIRST BLOOD PART II when you were captured by the Vietnamese? He kinda hung around the base real hard. And there was that blond officer who sent you in and cancelled your extraction flight – remember what Trautman did then? Yeah, he warned that blond guy that you’d get him. He warned him real good. He really told that guy. That Trautman’s a real pal! If only America’s leaders would pay closer attention to brainless action movies, they could have avoided Afghanistan in 2010 becoming America’s second Viet Nam. If the politics doesn’t kill you, the irony will. Final scene: Rambo and Trautman are surrounded by the whole Russian army, like Butch Cassidy and the Sundance Kid. Only stupider. Marc de Jonge in his badass helicopter gunship entreats them to surrender. It looks like lights out – until the Mujahedeen come to the rescue! Hooray for ‘the terrorists’! With their horses and single-shot rifles, they take down the Russian tanks and infantry armed with automatic weapons. Reality at its most drunken French kiss. It helps that Trautman has one of those Movie Guns that never runs out of ammo. Yet the question remains for director Peter MacDonald, How can we make this spectacle bigger and stupider? Rambo in a tank plays chicken with the gunship – and rams it head on while it is flying at him at ground level. Now that’s politics. Having run out of body oil, Rambo bids his muslim friends goodbye, assuring them that America would support them forever and not demonize them or fear them for their olive complexion or stereotype them as terrorists. And the muslims believed him because America is such an open-minded, intelligent, peace-loving country… the same country that brought them the open-minded, intelligent, peace-loving film RAMBO III. 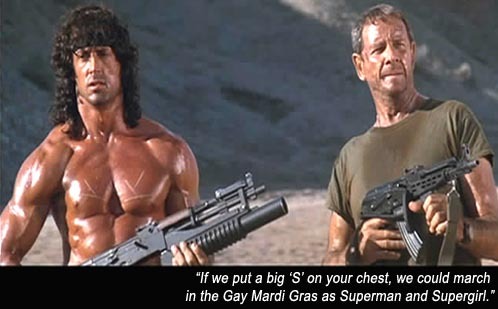 aka: RAMBO: FIRST BLOOD PART III. Writers: David Morrell, Sylvester Stallone, Sheldon Lettich. Starring: Sylvester Stallone, Richard Crenna, Kurtwood Smith, Marc de Jonge, Spiros Focás, Sasson Gabai, Doudi Shoua, Randy Raney, Marcus Gilbert, Alon Aboutboul, Mahmoud Assadollahi, Joseph Shiloach, Harold Diamond. Y’know, we can gag all we want about Rambo/ Stallone’s physique, because it is a visual hyperbole, an eccentric departure from all those specimens of human males around him, but goddammit if we ALL wouldn’t like to be that shithouse-built, just for once in our wretched gym-hitting lives. There’s no pretense in RAMBO III’s title – a clarion call to fans that the movie is unequivocally centered on Stallone’s iconic war machine – but the name makes absolutely no sense. For there to be a RAMBO III, there had to be a RAMBO II, which there isn’t. The film considered RAMBO II is called RAMBO: FIRST BLOOD PART II. Further, the film that the filmmakers want us to consider as RAMBO I is called FIRST BLOOD. And the first film that is actually called just plain “RAMBO” (a title which would connote it is the first film in the RAMBO series) was released in 2008, 21 years after RAMBO III, making it technically RAMBO IV, in the weird numbering universe of the RAMBO franchise.